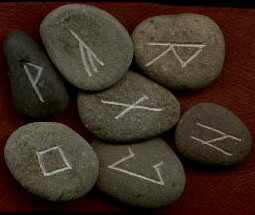 Click on a photo' to see a chart of runes plus comments. N.B. 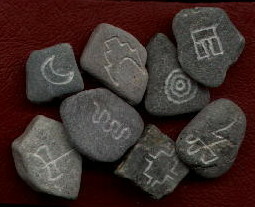 sets of runes made by Stone Mad are made from natural pebbles and vary in size and shape. 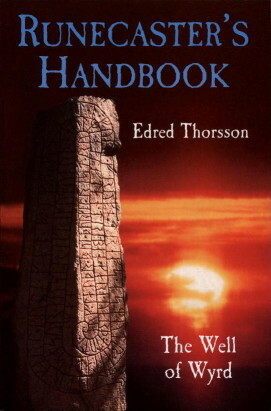 I have chosen to show a large, rounded futhark set, a tiny, rounded futhorc set and a medium-sized Pictish set made on squarish and/or angular stones, in order to display the variations which are available. This does not mean that all Pictish sets are angular or all futhorc sets are tiny: any rune-set can be had on any size or shape of stone, within reason and depending on availability. I.e., if you want a futhorc set cut on angular stones and we only have rounded ones in, we can ask Stone Mad to make an angular set up and he will, but it could take two or three weeks. 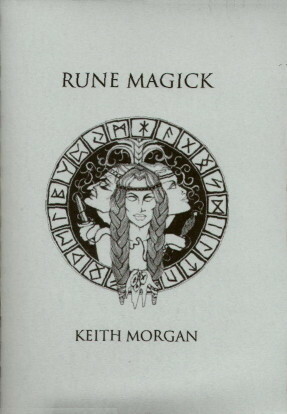 Beginner's guide to the history and the magical and divinatory uses of runes, including the making of bindrunes, with detailed information on each runestave. A clear, thorough and thoughtful guide to divination with Norse futhark runes, including the ritual/religious significance of rune-casting. We also have little drawstring leather bags suitable for keeping rune-stones in. 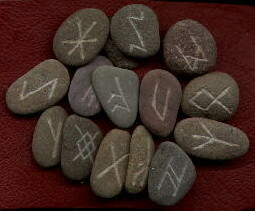 Prices vary according to size but are around £3 for a bag big enough to hold a set of smallish runes.